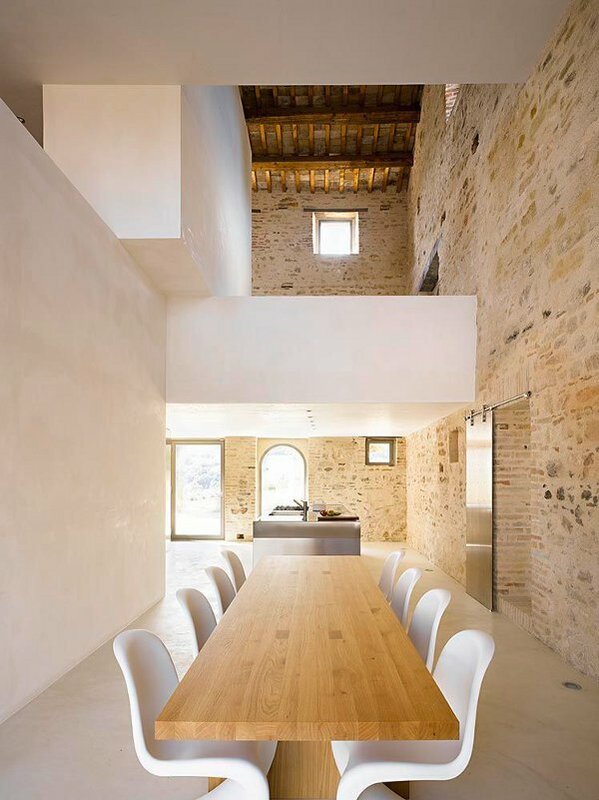 Casa Olivi is a three hundred year old farmhouse, located in the Le Marche region of Italy. The home was revamped into this marvelous modern farmhouse by Markus Wespi and Jérôme de Meuron (website in German). This fantastic space has gorgeous and expansive views of rolling hills, from almost every position. Various shades of green create a fabulous backdrop for the home. 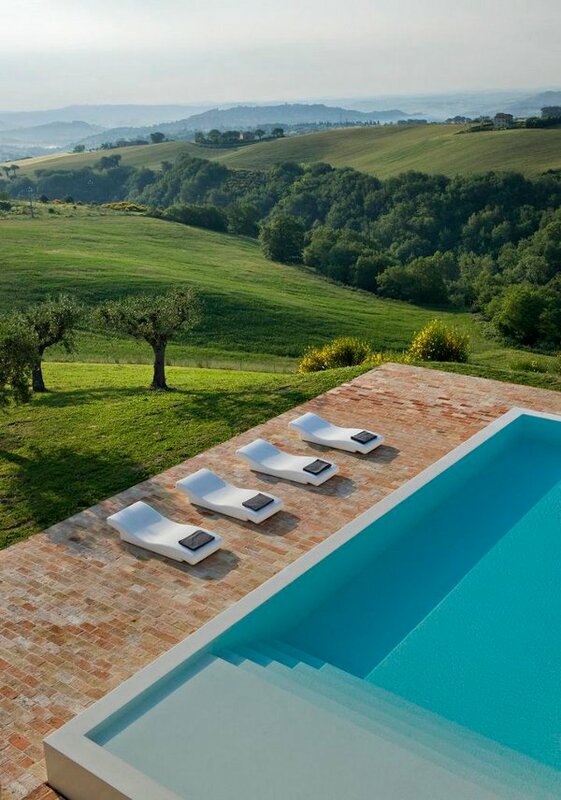 The exterior is a neutral colored stone and the pool is large and inviting. White modern seating surrounds the pool, keeping in line with the design of this modern farmhouse. The outside area, including the pool area, has brick flooring. White modern seating, lines the outside table, and a stainless steel outside kitchen, provides cooking space. 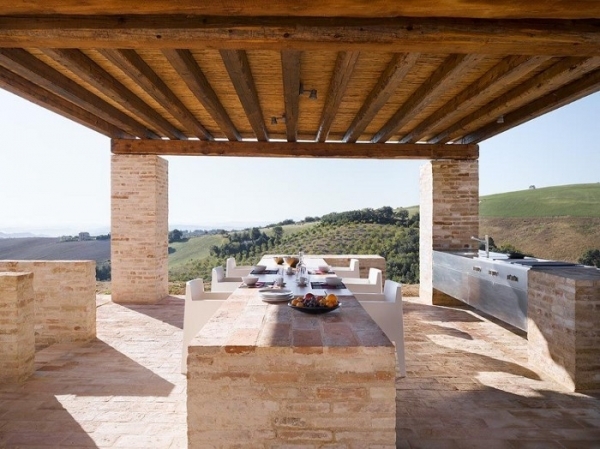 It is covered by a warm colored, wooden pergola, creating shade and comfort. And of course, there are more wonderful views. The interior of this home is stunning and clean. The bedroom has an oversized bed placed against a snow white wall. The stone from the exterior continues on the inside of the house, providing interest and texture. 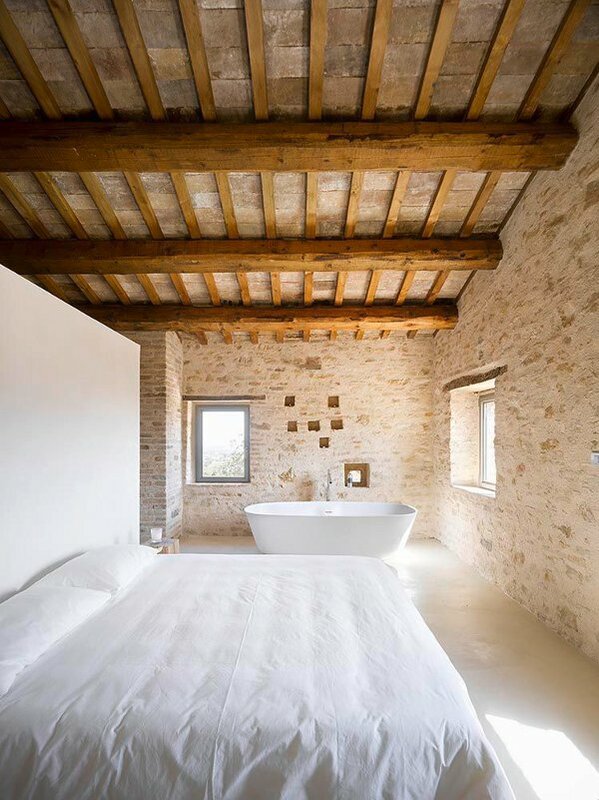 Thoughtfully placed windows allow natural light into the space, and a large white soak tub sits against the stone wall. Thin wood beams horizontally line the ceiling, and large ones vertically do the same, providing just enough decoration, in this modern farmhouse. High ceilings and modern shapes take center stage on the ground floor. White walls and ceilings are asymmetrically used, to divide the sections of this modern farmhouse. This creates an intriguing puzzle that rises to the summit of the home. The dining room has a beautiful, long, wooden table, and white modern seating; clean and simple. This home is absolutely stunning. The beauty is in the natural details, the modern decor, and the eye-pleasing views. Simple, yet effective. Modern and classic.